Antique quilt, circa 1910, Strippy Bars from Illinois, possibly Mennonite. 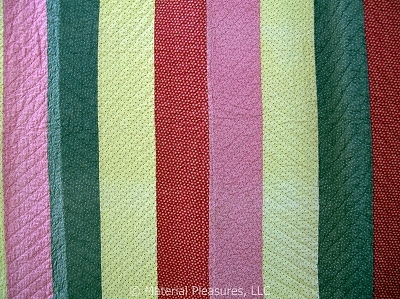 It measures 75" by 84" with bars measuring 5" wide in red, pink, green, and yellow cotton prints. It is machine pieced and hand quilted in white thread in an allover Chevron pattern, with the direction changing in each bar, each line about 1" apart. There is a small blue and white check cotton on the back, and the batting is thin. Edges are finished by hand with the front brought over to the back. The backing is a white cotton solid fabric. Batting is thin. It is in very good condition, there is some minor fading in the folds, and one small repair...it looks like tear that went all the way through, and it was stitched closed. More noticeable on the back, than on the front.